Intellitec's Water Pump Controller, first in the family of MONOPLEX devices, offers the following benefits to water pump switching. • Minimizes the use of heavy gauge wire that runs throughout the coach. Only two 14 gauge wires need to be run from the power source to the pump. • Multipoint switching can be added any where along the network using simple wiring. • Signaling from multiple points along the single wire MONOPLEX TM can be easily accomplished with inexpensive switches,providing momentary contact to ground. • Simplified switches (momentary buttons) increase reliability. 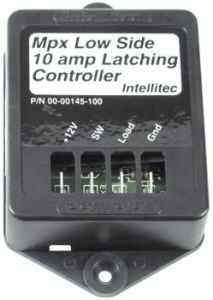 • Negligible standby current makes this system superior to conventional multipoint relay switching. • Labor and initial installation costs are reduced compared to multipoint switching using conventional switching. used to control a variety of other loads such as lighting, other pumps, fans, etc., when it is convenient to switch the ground side. single wire. Power can be supplied from either the battery or converter.